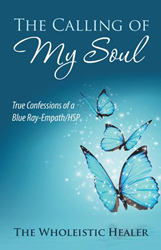 The Wholeistic Healer marks her debut in the literary limelight with the release of “The Calling of My Soul: True Confessions of a Blue Ray-Empath/HSP” (published by Balboa Press). The memoir narrates her unique journey of growth through hard life lessons and overcoming them with the help of heaven. “The Calling of My Soul” tells a gifted medium’s true life experiences of not fitting in, but having higher guidance that lead her to fit in with herself. She grew up being told she was “imagining it,” but continued to believe in herself anyway, overcoming obstacles with a little help from heaven. The book also shares true accounts of mystical experiences and miracles from angels and spirit guides — revealing both the gifts of their guidance and knowledge that they give to people. Moreover, the author’s story speaks of the difficulties of an empath/HSP to find their place in the day-to-day world with this understanding and power. In essence, it is a recollection of overcoming anything that life brings, by following the calling of one’s own soul. To purchase and know more about the book, readers can visit https://www.balboapress.com/en/bookstore/bookdetails/787062-the-calling-of-my-soul. The Wholeistic Healer is a small town girl who “never quite fit in anywhere.” In her early 20s, she was physically sick and emotionally traumatized by life’s trials. It was when she began to listen to the calling of her own soul that she realized the true meaning of life. She is a shamanic-certified master clinical herbalist, certified master clinical aromatherapist, reiki master, reverend, light worker (friend of the light), certified fairyologist, angel card reader, medical medium and earth angel. She grows her own organic herbs and creates healing alchemy with them, and distills her own essential oils and hydrosols. It is her life’s purpose to heal humanity completely — mind, body, and soul. Readers can know more about her at http://www.wholeistichealing.net and at http://www.facebook.com/beckyjothehealer.